From time to time, all the stars align to produce the perfect meal; this infrequently coincides with a rare, beautiful Seattle night. We just don’t have many “perfect” evenings where a group of friends can sit on the deck in sleeveless tops and shorts, and enjoy a balmy night from early evening until well past 10 at night. Truthfully, I can count the times this has happened on one hand. Thankfully, just such a night transpired this past weekend. This perfect meal revolved around my girlfriend’s heavenly ribs. 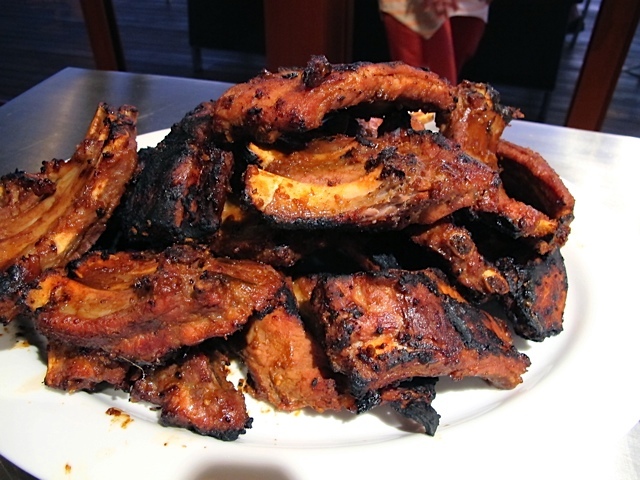 They are, in my opinion, the best ribs this side of the Mississippi. She labors over them – boiling the ribs the day before serving in chicken broth with lots of garlic and ginger, then draining and marinating them again before they finally find their way to the barbeque grill. She admits it’s a lot of work but the sighs of delight from her family and guests make it oh-so-worth-it. Luckily I get invited around once a year for this memorable meal and it usually happens in conjunction with a rare weekend visit by her adult kids. Double bonus! Champagne in hand, we sat on the deck visiting and watching the gorgeous sunset as we gazed west toward Seattle. 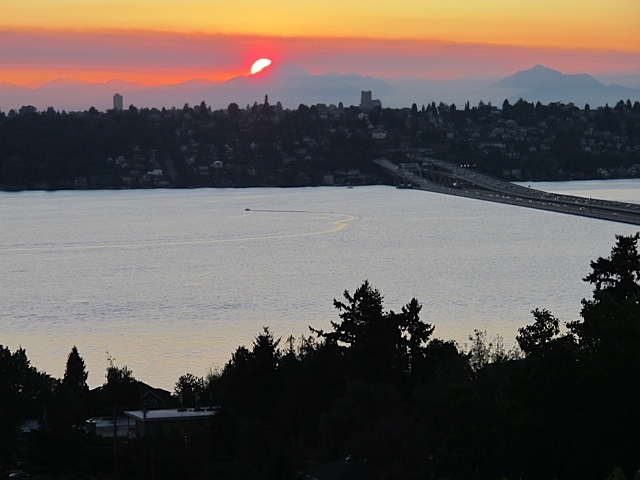 The buildings downtown were bathed in red and orange and the Olympic Mountains seemed to glow as the setting sun peeked out behind rose and purple colored clouds. My friends compared this to the Hawaiian sunset. All I know is that it was beautiful beyond words. I didn’t want to plop them in a bowl without any embellishment, so I looked through her cupboards and dressed them lightly with thick, fruity balsamic vinegar and good olive oil, then liberally sprinkled in roasted, shelled pistachio nuts and fresh ground pepper. I was looking for walnuts to roast but couldn’t find any in the cupboard, so pistachio nuts were the default – and their bright green color and salty crunch were the perfect addition! I only wished I had some red beets for even more color. I thought about adding crumbled feta cheese but decided less was more. In addition to their vibrant color and pleasing taste, beets contain many healthful properties and are excellent for your heart and high in antioxidants that can reduce inflammation. Pistachios contain potassium, magnesium and phosphorus, so the beet salad I prepared ended up packing quite a nutritional punch! Everyone was good and hungry when we got in line at the informal buffet in the kitchen. The plates were piled high with ribs and large servings of Caesar salad, and to my delight the guests were very excited about the beets. We all had seconds of everything and folks wanted to know what I did to make the beets so wonderful. To me, fresh but simple preparation of vegetables always is best — and I will make these beets again for certain. When dinner was over we pushed ourselves away from the table to relax outside. 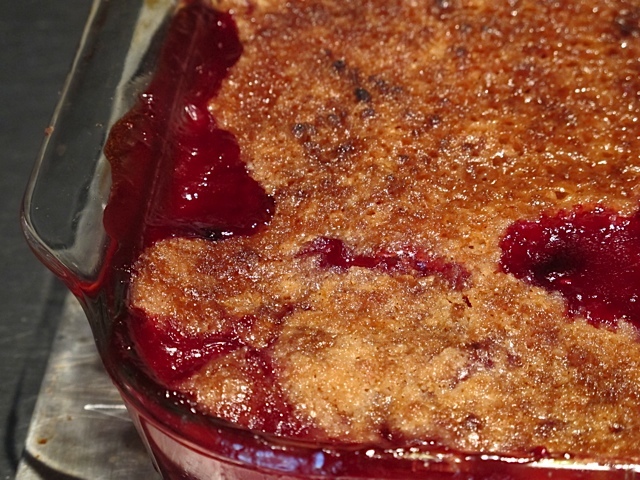 After an hour or so of chatting and mingling, we were ready for dessert – a freshly baked berry crisp topped with ice cream. The perfect ending to a perfect meal. As a birthday gift to my friend’s son Matt, I let him choose what type of cookie he wanted and sent a list to him before the dinner – giving him several options – from chocolate chip to gingersnaps. As I predicted he wanted snickerdoodles, so I presented him with a large bag of about three dozen cookies. He quickly hid them upstairs in his room. I wonder how long they lasted! Remove the beet greens and reserve for cooking later on. Scrub the beet bulbs well, trim off the root and stem ends and wrap them tightly in aluminum foil. Place the wrapped beets in the oven for 50 minutes to one hour, until tender. Remove from the oven and let cool for about 15 minutes inside the foil. Unwrap and put on kitchen gloves. The peel should be easy to slide off. Cut into serving pieces (about 4-5 wedges per beet) and store covered in the refrigerator. When ready to serve, bring them to room temperature. Add the mixture of olive oil, balsamic vinegar and salt/pepper. 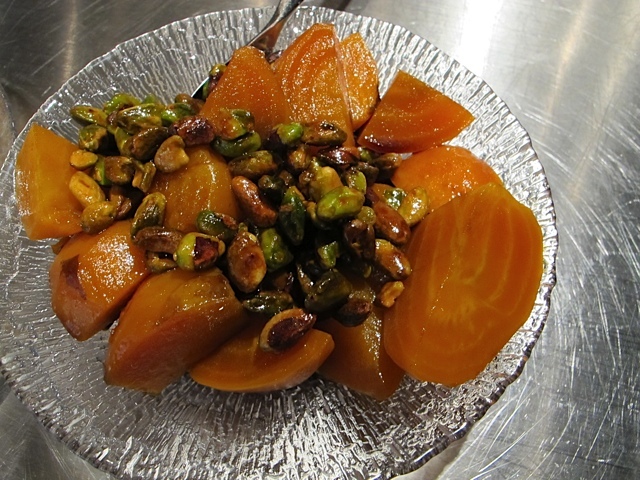 Place in serving bowl and top with the pistachio nuts. Be sure to save the beet greens and sauté in a little olive oil for a delicious and healthful side dish. This could morph into a salad too – I would combine some seasonal greens or arugula with the same vinaigrette and place the dressed beets and pistachios on top! As mentioned, you could make this dish with traditional red beets or a combo of golden beets and red beets. Chopped parsley would look nice on top. Toasted walnuts or toasted pumpkin seeds would be a nice substitute for pistachios. Alternately you could add some crumbled feta on top of the beets. This entry was posted in North America, Salads & Dressings and tagged Beets, Ribs, Seattle. Bookmark the permalink. 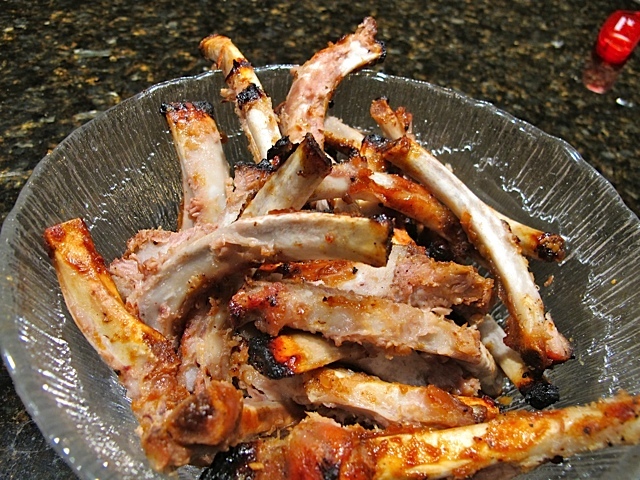 The weather was so perfect for BBQ ribs…I have them just once a year!